Location: The empire range is located along the west bank of the Panama Canal near the Pedro Miguel Locks on the Pacific side of country. The range is located approximately 10 miles west of Panama City near the town of Cocli. Brief History: The Empire Range is named after a former canal construction town located along the west bank of the Panama Canal. The town of Empire was about 6 kilometers (km) northeast of the Pedro Miguel Locks. Another canal construction town, Culebra, was located about 2.5 km southeast of Empire. Both towns were established in the early 1900s. In 1904, two U.S. Marine Corps Commands, Camp Elliot and Camp Otis, were established near Culebra. Prior to the turn over of the Canal and U.S. military bases in Panama to the Panamanian Government in 1999, the U.S. military controlled more than 75,000 acres of land. The land included over 7,000 acres of range area including two Army ranges (Empire and Pina), and an Air force bombing range known as Balboa West. This entry in the UXOInfo.com UXO site inventory database covers the Empire Range Complex. The Empire Range is a former U.S. Army training range located in Panama. The range was established after 1949 when canal defense fortifications were dismantled after World War II and property transfers occurred. The Empire Range was used by the U.S. military up until the mid 1990s when training was stopped to prepare for the transfer of the property to the Government of Panama under the Panama Canal Treaty. The use of the range changed throughout the forty plus years it was in use but in general, the range remained within the same general area. The range is setup like a traditional U.S. Army training complex with a central impact area and firing points and fixed ranges surrounding. Over the years, at least 19 firing points were established surrounding the impact area to support training of mortars, projectiles, and other munitions into the impact area. At least 10 fixed ranges were also established as part of the Empire Range Complex. These ranges included small arms ranges, rocket ranges, projectile ranges and multi-purpose training ranges. Some of the fixed ranges fired into or towards the impact area while other were adjacent to the impact area. The U.S. military also had a demolition range, EOD range, and a grenade range as part of the Empire Range Complex. The fixed ranges and firing points (with firing fans) were located at various locations surrounding or adjacent to the 600-hectare main impact area located in the southeast portion of the Empire Range Complex. 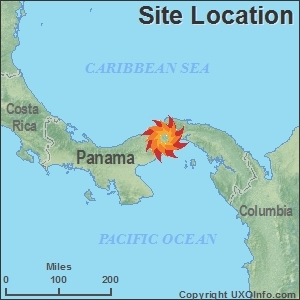 The northeastern boundary of the main impact area is within 1.5 km of the Panama Canal. The main impact area is a hilly area characterized by an irregularly shaped ridge line along its southwest boundary and a flatter area to the east toward the canal. A conically shaped hill known as Cerro Sierpe is a prominent feature near the northeast boundary of the main impact area. Tributaries of the Quebrada Conga and Rio Sierpe rivers flow from hills in the main impact area, and these two rivers converge near an extensive wetlands area in the northeast portion of the main impact area. Associated Munitions: Almost every type of ground munition used by the Army for training has been deployed on Empire Range including mortars (60mm and 81mm), projectiles (40mm, 90mm, 105mm, 106mm), rockets (66mm), small arms, hand grenades, and submunitions including M42s. Activities Completed: The U.S. military completed several studies of the ranges and a very limited range clearance effort in preparation for the transfer of the ranges to the Government of Panama. Only a fraction of the ranges were cleared to surface or very near surface. The Government of Panama has done some limited clearance during the construction of the new Bridge Over the Americas and to support canal expansion areas. New locks are planned for the canal which go through portions of the former Empire Range. Issues: The Empire Range Complex is adjacent to the Panama Canal and is in an area that is slated for part of the expansion plans for the canal. Several hundred acres of former range land is potentially impacted by the construction. Other Information: For the most part, the U.S. military has claimed that it has met the obligations of the treaty and has left Panama to deal with the legacy UXO site problem with little to no assistance from the State Department.